Essence No1 Rose: Voluptuous and enveloping like layers of precious fabrics. Essence No1 Rose weaves the most magnificent essences and absolutes of Centifolia and Damascena Roses. Vanilla and Cedar dress the trail of the Rose with a thousand faces. Essence No2 Gardenia: A true olfactory trompe I'oeil, a blooming sculpture crafted from the duality between creamy wood tones and tender floral notes, with exquisite green and white accents. The sophisticated and elegant trail is revealed in a caress of rare and precious Indian Sandalwood. Essence No3 Amber: A luminous reinterpretation of a mythic Haute Parfumerie accord: Amber. Essence No 3 Amber pays tribute to the essence of the Couturier's dazzling work. The brightness of a fragrance bursts forth from darkness, a spectacular embroidery of black glitter and coppery crystal. Patchouli is resplendent and sandalwood dazzles. Essence No4 Oud: A virtuoso variation on a black monochrome where powerful volumes and subtle textures meld in an architecture silhouette. The Intriguing and spicy nuances of Black pepper and the unctuous soft curves of Benjoin triumph in this ode to the mystery and depth of sensual Agar wood. Essence No6 Vetiver: By turns radiant and dark, creamy and dry, verdant and smoky, vetiver is a stunningly mutable material. A 'vertical" wood-scented essence whose contrasting facets express themselves from top to base notes – or rather, from crown to roots – in a composition. A perfume in and of itself. Essence No6 Vetiver blends the two noblest varieties of this potent, complex ingredient: Haitian Vetiver, round and soft, and Javanese Vetiver, dry and smoky. A sublime metamorphosis, imagined as a fragrant echo to Elie Saab's sublimely sensuous silhouettes. 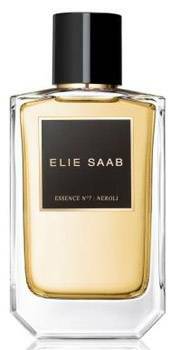 Essence No7 Neroli: Just like Elie Saab showcases his most precious materials with boldly simple silhouettes, the perfumer composed a streamlined formula to highlight the crystal. Purity of his neroli. White cedar, with its smooth, 'fresh wood" notes, to give it structure. Adding contrast, the burning spiciness of clove underlines the flower's sensuousness and binds it to the woody base notes. A breeze of musk, like a rippling veil of silk chiffon, extends the radiant sillage into infinity. All six essences will be available for 4 weeks in Myer Sydney and Myer Melbourne 16th November 2015 to 13th December 2015.